The church plant with Pastor Volva have a team headed up by Natasha and assisted by Julie and others. When Team Canada (photo) met this team last year, they were feeding 60 to 80 dear street people twice a week with soup, tea and bread. Their cost was $ 50 US per month. With our assistance, they have been able to feed these people five days a week. So we praise God that we have the opportunity to help these folks. This note is to relay to you the sad passing of Anyas mother. We first met Anya on the streets of Dnepropetrovsk, Ukraine, in September of 2002 where she and her mother were being fed by those dear people of Church Revival of Dnepropetrovsk. We saw her again last October where she was still on the streets but by then being fed five time a week . Dale Hughes has just phoned back from Ukraine and reports that Anyas mother has passed away and that Anya is now in an orphanage. Unfortunately, Natasha, the street ministry head, does not know where Anya is. They are trying desperately to locate her. 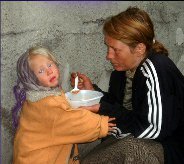 Pray that God will direct them to Anya and that this sweet little girl can be brought out to a loving Christian family. Attached is a photo of Anya and her mother at one of the feedings. It may help you to pray when you look into her eyes. Photos show Pastor Volva -Tallest and seminary student Samir in the rubble that they have been cleaning out. We hope to finish off the building and dedicate it to God’s business. Last picture is a cell group, they thrive on these groups as in most situations they do not have a church building.